OMAHA, Neb. (KMTV) -- — Problems with daily tasks and dire heating situations were prevalent in Omaha Wednesday. The low hit -14, and with wind chill it was -37 in the metro. It made normal tasks difficult; some drivers had trouble putting air in their tires because the tire valves froze. Workers making runs inside and out didn't stop to worry about the temps; deliveries of mats and packages made their deadlines despite the dangerous cold. A warning to thousands of travelers on the interstate about what to do if stranded in the extreme cold. It was the coldest day since New Year’s Day 2018. HVAC companies like, SOS Heating & Cooling, are working non-stop making sure residents and businesses aren't left in the cold. 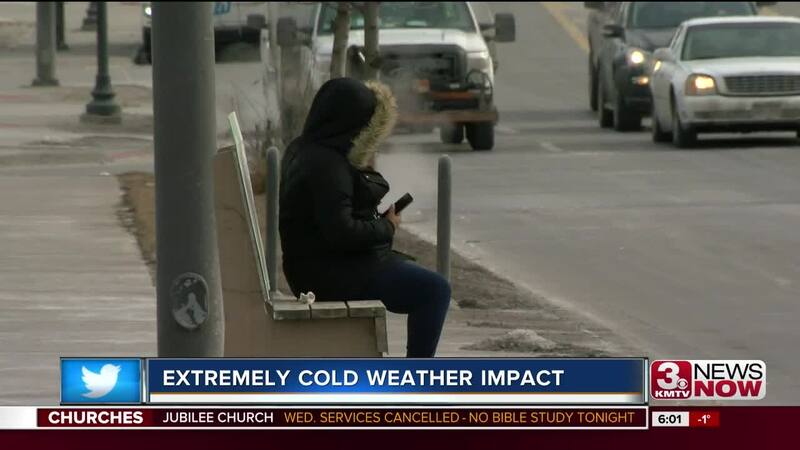 "With the extreme cold weather, it is busy. I would say this morning just between about 5:30 and 7:30am we took about 10 calls," said Alex Kupon, Service Tech with SOS Heating & Cooling. SOS recommends changing your air filter, making sure your thermostat batteries are good, and get your furnace cleaned or tuned up so you don't get left in the cold.